Shi-on and In Hye are really cute buddies although I suspect In Hye has a little crush on Shi-on. This episode finally clears Shi-on name and he was not to be blame for the incident. Honestly, I am really angry when the people around him did not stand by him. Just as Shi-on stated, he cannot lie therefore I am angry that the management did not conduct an investigation and just ask him to take the blame. Nonetheless, I am glad that this incident was over and Shi-on is back in the hospital just as expected. The process of getting Shi-on back to the hospital is nothing dramatic. Iam just glad that Shi-on is back in the hospital and resume his duty. 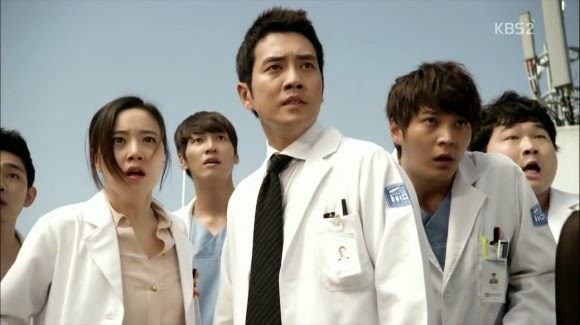 I like the doctor-patient relationship between Shi-on and Eun-ok. At this point of time, Shi-on is the best person to take care of Eun-Ok. i just hope that Eun-ok guardian will not find trouble for Eun-ok, although i am sure that will happen. Nurse Jo and Nurse Nam is very compatible and I find it hilarious that nurse Jo gave a bottle of facial cream to nurse Nam. This is a rather sensitive topic for ladies when youth is concern but Nurse Jo is obviously oblivious. The pediatric team bonding session at the library and the karaoke was plain fun and interesting. Their ridiculous costumes and the way they sing the songs are killing me! Lastly, the introduction of the opera boy who hurt his vocal cord is sure to gather empathy from the viewers. I supposed the opera boy pretended that he is alright when he wasn't. His mother looks frightening too. The pressure on him had driven the opera boy to attempt suicide at the rooftop.